Top: One of my trusty Kuretake waterbrushes, now getting a little worn. thing between the brush and the reservoir to regulate the flow of water. Hence, water gushes out way too fast. With all my talk about the papers I’ve been trying, I’ve said very little about brushes. I started out sketching with a waterbrush – an ultra-convenient, synthetic-hair brush with a built-in reservoir of water that releases with a squeeze. After trying every brand available on the market, including the Pentel, Sakura Koi, most recently the Holbein (see comments in the photo caption, right) and a really crappy one that I don’t recall the name of, my favorite is still the one I started with, the Kuretake. People complain that the bristles wear out quickly, but in the two years that I’ve been sketching, I’ve replaced it only once (it’s probably time to replace it again, which means it probably lasts about a year). In classrooms or in my studio where I can keep a jar of water on the table, I enjoy using real brushes, and I can see that they make better strokes and more consistent washes, and they are easier to control. But the reality is that I rarely sketch or paint in my studio, so I keep saying that I should use real brushes more often in the field. I always carry one or two in my bag, but once I get out in the field, I think about the fuss of putting clean water in a container and the precarious setup of using it while sketching standing up, and more often than not, I reach for my ultra-convenient Kuretake waterbrush instead. When I was reading The Laws Guide to Drawing Birds, a beautiful book filled with delicate, intricately detailed paintings of birds by John Muir Laws, I was startled – and inspired – to read that he uses only a waterbrush while in the field (often in an awkward position while observing a bird through a scope!). If a waterbrush is good enough for Laws, it’s good enough for me. Top: Open Kuretake waterbrush. Bottom: Open Escoda travel brush. compared to the Kuretake waterbrush. I’ve decided that when it comes to urban sketching, convenience trumps results. I do still carry my very compact Escoda Reserva sable travel brush (size 8) and pull it out occasionally to wet the paper for a quick wet-on-wet sky, because the waterbrush is badly suited for spreading large washes of water. But for everything else, I’m happy with my trusty Kuretake. Interestingly, intrepid urban sketcher Liz Steel recently blogged about painting with a waterbrush, including her tips for getting better results. For a relatively comprehensive review of various waterbrushes, I always refer to Russ Stutler’s excellent resource. Updated 3/6/14: I've also found that the waterbrush is an ideal tool for applying shading during short poses at life-drawing sessions. I go back and forth about using a water brush. Lately I've been using them more (I have 4 sizes) and enjoy the simplicity. I've figured out how to keep them a little drier so I can get more intense color on the page. Yes, getting the right amount of water is the tricky part. Interestingly, Liz writes in her blog about using more water to get better control. I find that I have to use my mixing tray more, and sometimes my paints get washed out. But over time, I've gotten better at controlling color intensity, too. Until I read Russ Stutler's observations, to which you link, I was going to comment that I thought I was going crazy! 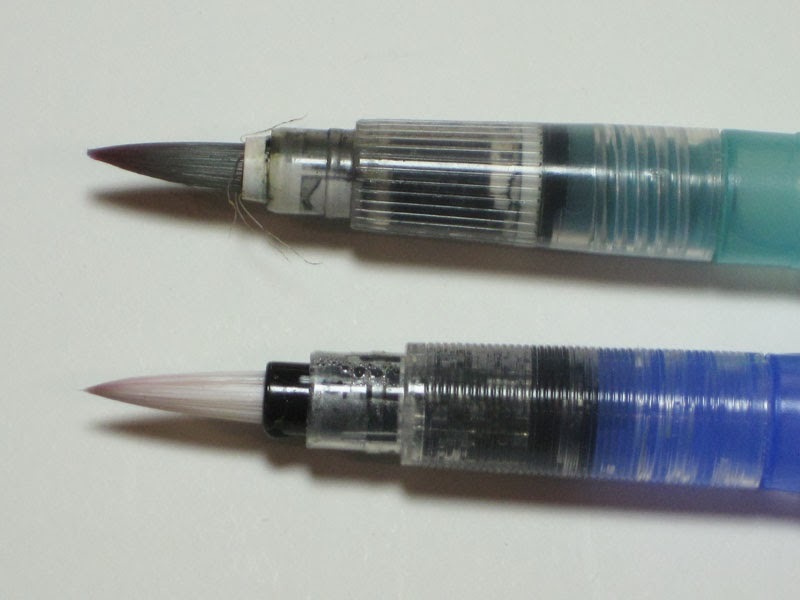 My Niji waterbrush is EXACTLY like your Kuretake, in every way... shape, color, "mechanical" parts... all the same. Now I see they are essentially the same brush, likely made to the same specifications. I'm using my Niji and it's the only waterbrush I have ever tried, but I don't really see how it can be improved upon, other than maybe with longer-lasting bristles. It's not as easy to control as a real brush with separate container of water, but it's extremely convenient. 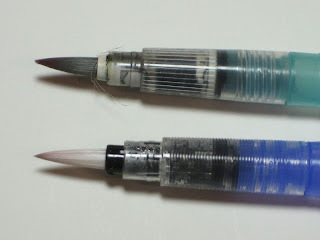 I used to be really confused by the Niji/Kuretake brand names, too! Over the years I think I've gone through all the portable (built in water and regular) brushes too and so far settled on the most compact one from Pentel. Urban Sketching for me is so much about rapid concentration that I have a hard time moving away from the water brushes - they're so quick and convenient.